This page is here to help you work out which voice part you should be singing. Warm up your voice – you can't do something like this (or sing properly at all) from cold so you need to have your voice warmed up. Sing the scales below several times each and make a note of which scales you are comfortable singing. Don't kid yourself – just repeat until you get a number on the scales going up and another number on the scales going down – this will give you your range. Men – remember to sing the lower octave! So now you've found the range that you are comfortable with – a scale going down number and a scale going up number. Have a look at the chart below and see which voices matches yours the closest – it probably won't won't match completely because we are all different – just make a "best fit". 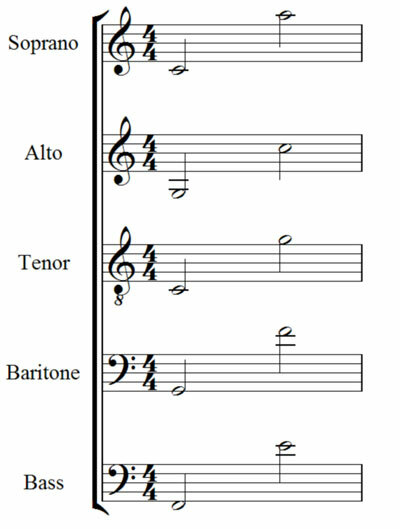 On the music these ranges look like the picture below – these are the ranges you are expected to cover easily in the music we sing. If you find that you've been singing in the "wrong" section then swap – it's as easy as that! You'll find that you can cover the notes a lot easier in the future.